I met Aissatou Traore last year at the Dakar, Senegal headquarters of Forever Living, a direct selling company that produces aloe vera and other natural health products. Forever Living is based in Arizona, but markets its products through a worldwide network of millions of independent distributors, including Aissatou. Aissatou is the sole breadwinner for her elderly mother and 14-year-old son, who she hopes will have the chance to go to university in Canada someday. She has a genius for marketing, and our conversation soon turned to the benefits of her products. She gave a riveting presentation, skillfully weaving international statistics, personal experience and client success stories into a mesmerizing narrative that left me thoroughly convinced that aloe vera toothpaste is a must-have staple of good oral health. Aissatou starts her day at five o’clock on most days. After a quick breakfast, she spends the next two hours reading books on marketing and entrepreneurship. Aissatou is an encyclopedia of market networking strategies and management one-liners. Motivational business posters deck her living room. Her favorite book is Being the Best You Can Be in MLM: How to Train Your Way to the Top in Multi-Level / Network Marketing-America’s Fastest-Growing Industries by marketing guru John Kalench. Aissatou usually begins meeting her clients at nine o’clock in the morning. As a saleswoman, Aissatou spends her time traveling in and out of Dakar to meet her customers at their homes or offices. When not assisting customers, Aissatou patrols the streets and public buses for new clients and potential partners. When she started as a saleswoman, most of her customers were friends and family. Today, they represent half. Aissatou’s marketing approach is direct and fearless. Armed with a badge pronouncing “I feel great, ask me why!” hanging around her neck, she proudly walks up to potential clients (typically mothers and middle-aged adults) to tell them about her products. With two years of increasing sales, Aissatou has mastered the art of salesmanship. “Confidence is key. I use my products, so I know they work. I have no problem or fear telling others about them. In fact, I feel like I’m doing people a service,” she explains. If a potential client shows interest, Aissatou gives them her business card and asks for their number. Aissatou then logs that number into her client book and schedules a rendezvous the following day. At these meetings, Aissatou brings a catalog of her products and lists her clients’ demands. Her best selling products are Vitamin C pills and organic juices. She then heads to her retailer, Forever Living Products, to buy the products at a discount rate and distribute them to her clients. 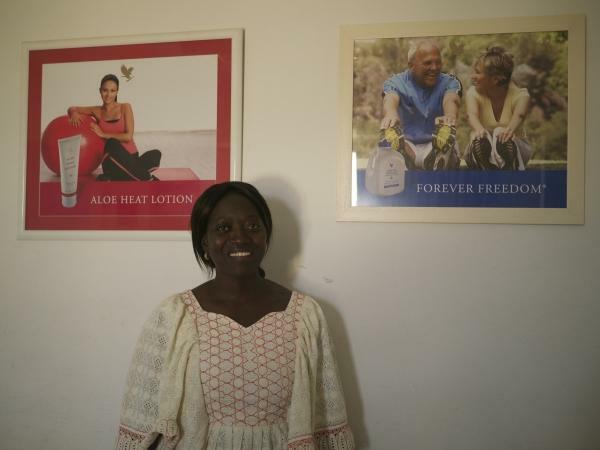 Last year Aissatou managed to purchase a large inventory of Forever Living products, which ought to have boosted her earnings substantially. Unfortunately, most of the inventory was lost to a thief who broke into her home and stole her stock before she had the chance to sell it. Aissatou suspects a neighbor stole her products and has been soliciting police stations ever since, to no effect. Completely out of money to buy new stock, but undeterred, Aissatou contacted her best clients one by one and offered a deal: She would give them a special discount if they would agree to pay in advance for the products, rather than upon delivery. She used the advances to restart selling, at a profit margin that was razor thin due to the discounts. She makes up for the narrow profits with volume: Her notebook contains the names of several hundred clients, many of whom are located in rural villages a day’s journey from Dakar city. On the days she “goes into the bush” to deliver her products to the villages, Aissatou wakes up at four o’clock in the morning to prepare the day’s meals for her fourteen-year-old son, and returns home as late as one o’clock the following night. This strategy enabled Aissatou to slowly reconstitute her working capital. Her hard work paid off this year, when she was promoted to a managerial position at Forever Living. With her last Zidisha loan, Aissatou was able to start construction on a house for her mother in Casamance. She showed us the floor plan for the house and is so excited to have broken ground. Her mother has been sick for the past two years and has been living with Aissatou in Dakar, but with the loan she will be able to build the house and make sure her mother is taken care of. Aissatou expects the construction will take four months, and after that she would like to take out another loan so that she can supply her two nephews with Forever Living inventory as well. She seemed completely unfazed by all of the obstacles in her path. By way of explanation, Aissatou cited the example of Bill Gates: He started on a small scale as well, and she is simply doing the same. She is a voracious reader. On the day we met, she was reading a French translation of The Leader in You by Dale Carnegie. Aissatou said she was inspired by Mr. Carnegie’s idea that there is a “mine of gold” inside each one of us, and that the best way to fully realize our potential is to develop our own business. She values her freedom, and says that nothing can stop her from reaching her ambitions. 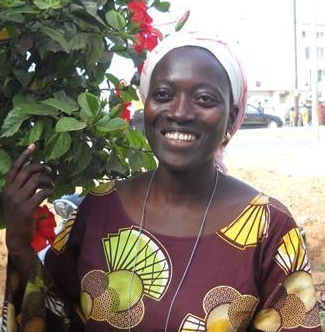 This post combines the narratives of several Zidisha staff who have met with Aissatou Traore. You may read more at her Zidisha profile page. Posted on February 27, 2014 by Julia Kurnia. This entry was posted in Uncategorized and tagged microfinance, p2p lending, senegal. Bookmark the permalink.